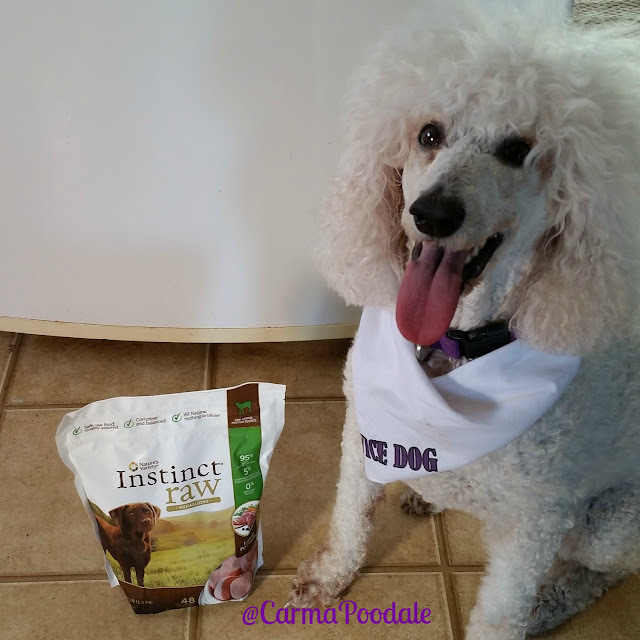 This post is sponsored by Instinct® and the BlogPaws Professional Pet Blogger Network. I am being compensated for helping spread the word about Instinct Raw but I, Carma Poodale, only shares information I feel is relevant to my readers. Instinct is not responsible for the content of this article. When people ask ma what type of food I eat, she tells them that I am on a rare diet. I prefer my food slightly warm or extra rare. Sometimes this isn't convenient especially while traveling or when we have been doing errands all day and she has forgot to take something out of the freezer to thaw. When 4:45 pm comes around, I start to give her the "hungry" eyes or I will stand in the kitchen and stare at her until I get her attention. I prefer to eat at 5:00 sharp. Most days I get my dinner on time but the days she has forgotten to take anything out of the freezer, I am looking at a can of food. Did I mention that I really don't care for canned food? There is now a product that takes care of those times that ma is forgetful! Thank dawg, we found Instinct® Raw. 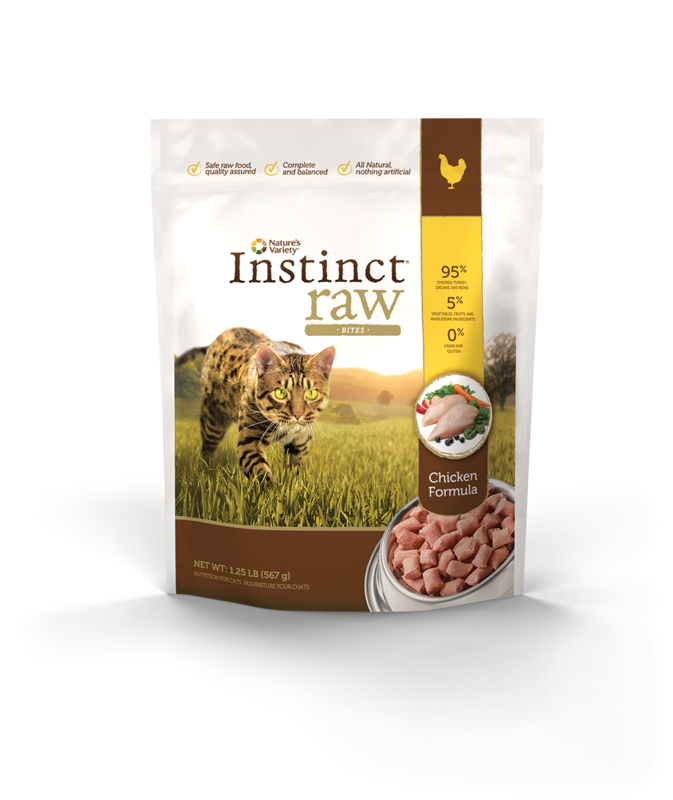 Instinct Raw is a complete meal that is made with 95% meat protein, 5% fruits and vegetables and 0% grain. Yes ZERO grain! When ma bought the first bag, she was a little worried. I am such a picky poodle who has been known to go a couple days without eating due to not wanting to eat the food that ma prepares. At least once a month we have a standoff. Ma thought I wouldn't be willing to try anything new and I would turn my nose up at it. She was soooo WRONG! Where has this food been all my life??!! She took 8 patties out of the bag and let them defrost on my plate. This took about 20,0000 hours. Well ma said it took about 20 minutes to totally soften and get to room temperature but to me it was 20,0000 hours. Hey, it was already half past hungry according to my tummy. Trust me, she tried to get my photo every mealtime but I kept my head over my plate so my floof would hide what I was eating. This was one food that I wasn't about to share! Normally when we try food all of us get to try it. This way I can give you a honest review of 3 out of 3 or 1 out of 3, etc like this food. Not this time. This is perfect food for me. Traveling, this food is perfect. Long day out or ma not able to get out of bed due to her MS, this is the perfect food. Saturday, Friday, Thursday any day, this food is perfect. 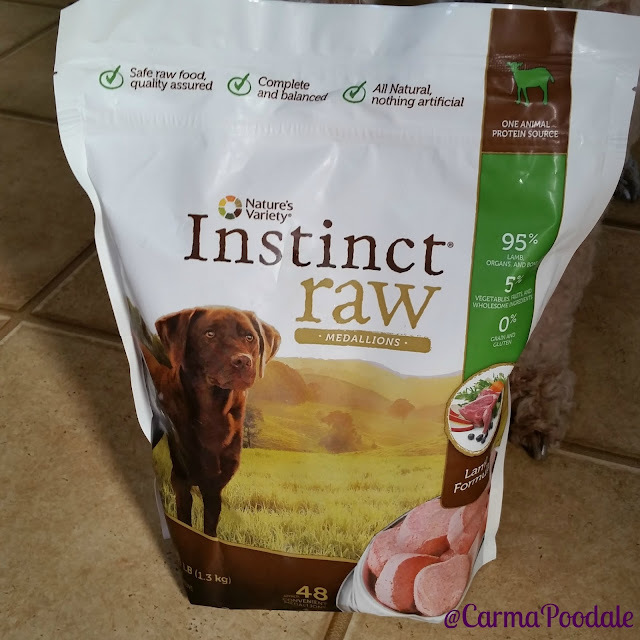 Instinct Raw comes in 3 different sizes for dogs. There is the patties, the medallions, and the bites. 3 different sizes for each size pallet. You can find the different flavors on their new Instinct Raw site. They also have raw for cats. They come in medallions and bite size bits too. They also have different variety for different pallets also. My final thoughts on Instinct Raw is that we have finally found a food that I can be a go go poodle with and its a food I look forward to having each night. 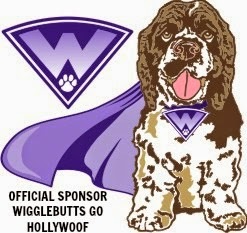 I have to give it 4 paws up only because after I eat it, I do the happy roll. If you don't feed raw now, what is stopping you?? Want more information about it? Want to know more than what I am telling you? Visit their website to find out how to transition or how much to feed. 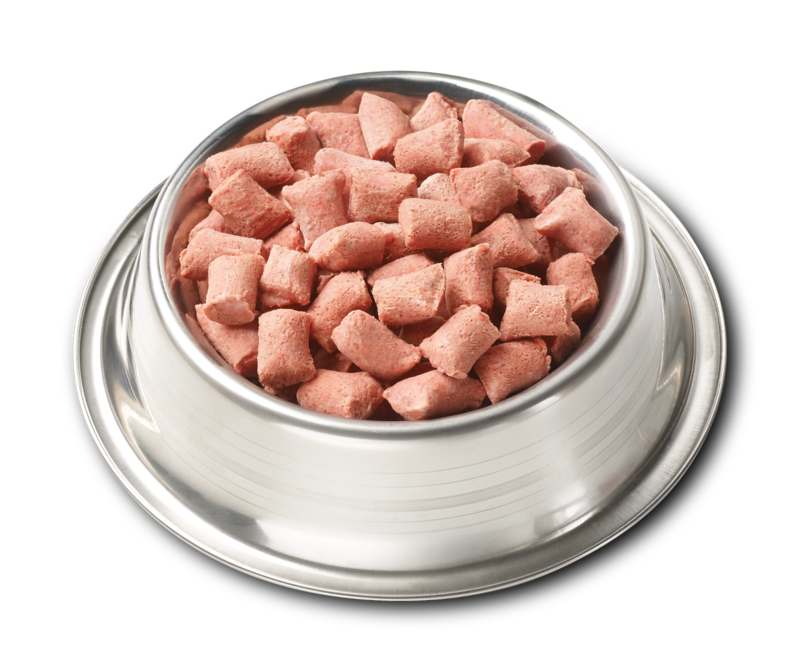 Nature’s Variety® Instinct Raw believes the most instinctive food for pets is a grain-free, all natural raw diet. Formulated to mirror your pet’s ideal ancestral diet, Instinct Raw provides pure animal protein for lean muscles and strong bones, natural ingredients for optimal nutrient absorption, and nutritious oils for healthy skin and coat – all in a convenient, safe, and delicious form your pet will love. What benefits can come from feeding raw? 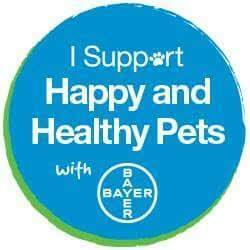 Do you or have you fed your pets a raw diet? Mmmmm, yummy. 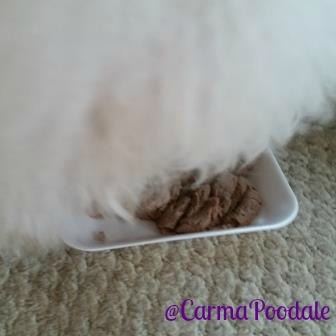 I am so glad you found a food you like, Carma. I remember how picky of an eater you can be! Enjoy! Raw is really all the rage!